Would you like to experience healing, the pure flow of vibrancy, well-being and energy right now? If you can create a space of healing inside, then you boost your own energy to be in a space of greater health in all areas of life. When you create space of inner-healing, then whatever is going on around you doesn’t create static in your well-being. Healing is an active state of continue well-being. This meditation will ease your spirit, relax your thoughts and bring you more health and wellness into your life. Join us right now, and move into a space of healing. 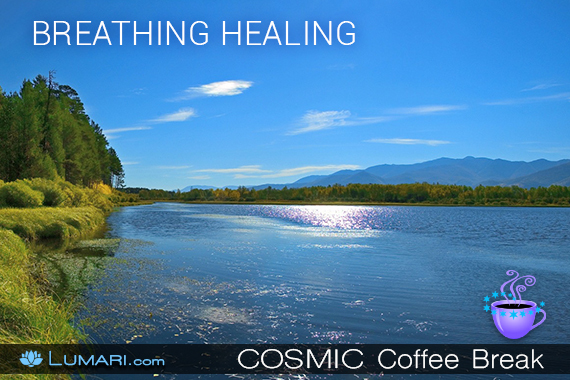 In this episode of the Cosmic Coffee Break, Lumari guides you in the BREATHING HEALING meditation. This meditation will ease your spirit, relax your thoughts and bring you more health and wellness into your life. You can do this meditation at any time to increase the healing and well-being in your life. Buy Lumari's books on Amazon Listen on, iTunes or Stitcher. © 2019 Cosmic Coffee Break. All Rights Reserved.